Please watch God's Creatures Ministry video! Copyright © 1998-2018 God's Creatures Ministry. All rights reserved. May be copied only for personal use or by not-for-profit organizations to promote compassionate and responsible living. 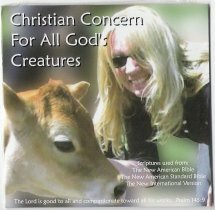 All copied and reprinted material must contain proper credits and web site link God's Creatures Ministry. Thank you for visiting God's Creatures Ministry.